Our Glass Flow Indicator is designed with one number cylindrical toughened glass. Sight Glass Flow Indicator offered by us is excellent to detect the flow and level of vertical pipelines as well as vessels. They are widely used for low-pressure process applications. Moreover, for various special applications, we can offer non-metallic sight glasses. 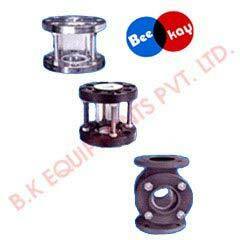 Today, we have carved a niche as one of the key Standard Glass Flow Indicator Exporters in India.